Walk the Dinosaur! | Hot Jambalaya! A couple of days ago I volunteered my dj services down to help with the OPS United Way Campaign Launch. There were the requisite speakers touting the tangible benefits of charity, but after William Thorsell’s speech things went back to the stone age! 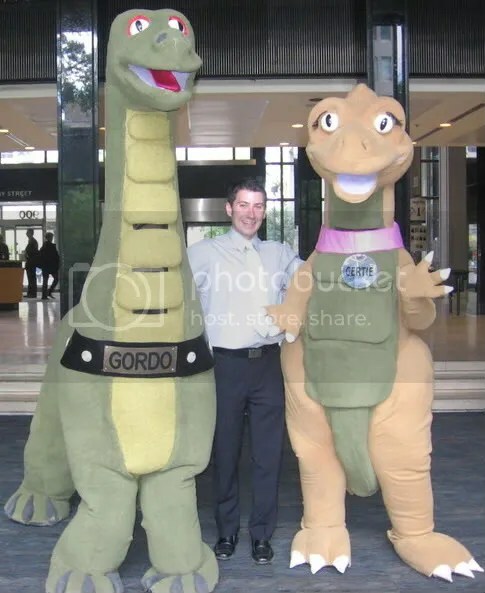 No, I’m not talking about the average age of the speakers 😉 Gordo and Gertie, the ROMs 2 living dinos, came down the aisles and handed out free passes to the ROM! Was (Not Was) – Walk the Dinosaur from 1983. What a piece of crap song. However, if ever there was an appropriate time to Walk the Dinosaur, it certainly was then. It’s moments like this that define a dj’s career…I hope to never again unleash that beast. But be warned, I have before and I can do it again. Thanks to Popdose for hosting. On my visit to the “Cassingle Vault” I discovered the video for Walk the Dinosaur. Did you know there’s a “Dino Dance”? You too can learn how to Walk The Dinosaur! If I see anyone doing this at a club I’ll buy you a drink. For real. ← Syntonics blow my mind! Honestly, I liked that song when it came out. Of course, I was a whopping eight years old. It’s still a catchy tune today. Cheese for sure, but when you think of what pop music has become, that one may be a classic in fromagity. I dare you to drop that some day. Double dare you to drop Who Let the Dogs Out.